For those of us in small business, one of the main concerns when putting up a web or blog site is, of course, getting found. While writing good quality content is extremely important when trying to get found, link building is one of the most effective ways to get noticed by Google. But what are links, why do we need them and how do we get them? Basically, a link is clickable text that you can follow to another page. Think about how you found this (totally awesome and wickedly interesting) blog page. You followed a link from somewhere. Perhaps it was from Facebook, Twitter or a search. But you clicked and followed the link here. The official name of the link is a backlink because it’s a clickable text that point the reader back to your article, website or blog post. The more links that lead back to your site the better because Google considers each backlink like a vote for your site. The more votes, the more popular you will be and the easier you will be to find. It’s important to understand that quality over quantity counts (although quantity is good too.) Google always ranks pages with links coming from high PageRank pages, with content related to yours, as more important and relevant than those with lower ranking and seemingly unrelated content. So linking to high PageRack sites in our niche is more important than simply getting links from unrelated sources. 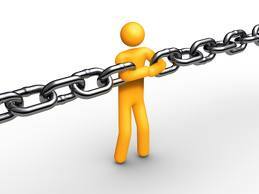 So how do we, as small business owners, develop an effective link-building strategy? While a good link building strategy always starts with great content and it does take some work, it’s not really that difficult to get going. Social Bookmarking Sites: Social Bookmarking sites are a great way to generating quality links for your website. If you write an exceptional piece of content that has a great headline or title that draws people in, people are more likely to share it on the various social bookmarking websites such as Digg, Stumble upon or Delicious. And while it is less favourable to submit your own content to these sites, if the content is good, with effective headlines and descriptions, you can get a lot of traffic from these sites. Guest posting: Social media is all about building relationships. One benefit of building solid relationships with those in your niche is the ability to guest post. This allows you to not only raise your profile but it also allows for links back to your own site. As always, creating first-rate original content with your audience in mind will help to open doors for you, but getting to know those in your niche works wonders too. Linking Out: It sounds counter-intuitive but linking out to attract links can be a good strategy. If you are know the most popular bloggers in your domain (and you should), getting involved in conversations on these blogs is a great way of making sure that you get noticed. Link out to these blogs from your site and take an active part in the discussion on their blogs. Most people track their blogs on regular basis and if they find your comments interesting, they may provide back links for your website too. The key point to remember here is that your interactions need to be genuine as you want to gain the trust of the bloggers and, as always, building relationships helps with building links. Commenting: Commenting has always been a good way to build backlinks to your website. When you comment, you leave your name and link to your blog or site. Commenting, however, should be of mutual benefit, with the blog owner benefitting from a quality, well-thought out comment. By commenting, you can get some recognition and a link. Article Directory submission: Submitting articles to article directories is also a good way of generating links for your website. These article directories provide direct links to your website and can divert a significant traffic to your website. To really get the maximum benefit, however, it is important to submit high quality original content as Google discounts duplicate content, Directories, such as Ezine articles, are excellent for creating exposure to your site. Building links is at the heart of any good SEO strategy. And while an SEO strategy always starts with good, high-quality content, with a solid link-building strategy you can go far in raising the findability of your site. What are your favorite link-building strategies? This entry was posted in Weekly Updates and tagged Backlink, Blog, effective link building, Facebook, Google, PageRank, Search engine optimization, Social Bookmarking. Bookmark the permalink.